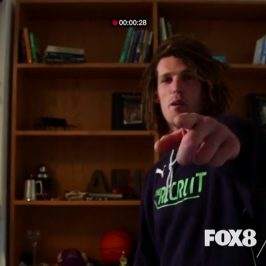 You can watch this season of The Recruit on Foxtel Catchup, Anytime and Anywhere. The second series of The Recruit kicks off with a new Head Coach – Michael Malthouse. After coaching more AFL games than anyone else, Mick has turned focus to finding new talent and pushing them to their best. 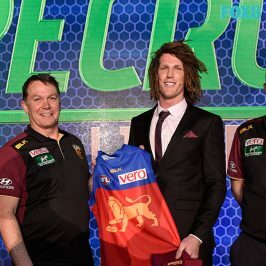 Joining Assistant Coach Ben Dixon, High Performance Coach Darren Burgess and Mind Coach Leigh Russell, the Executive Team have found the best 15 players from across the country who have missed their chance at being drafted to an AFL club. They have 10 weeks to eat, sleep and breathe AFL – with one Recruit winning the opportunity of a lifetime – an AFL contract. This week is all about ‘facing fears’. The 14 Recruits head to Tasmania for a Captains Challenge at the highest commercial abseil in the Southern Hemisphere – The Gordon Dam. For Justin and Jackson, this terrifying challenge pushes them to their limits. That evening, camping with Coach Michael Malthouse on the edge of Lake Pedder, the boys open up and learn more about their team mates. The Hobart City Demons host this week’s game at a ground steeped in history, but could injury end the AFL dream for one of our Recruits? As the Recruits hit the road again, “Giving Back” is the theme of the week and the boys put this in to practice as they hold a kids AFL clinic in Darwin. In conditions most have never played in before, the team head to the Tiwi Islands for a game against Rio Tinto’s Top Indigenous Players from the ‘Footy Means Business’ program. The sweltering heat proves too much for some and Coach Malthouse has no patience for a couple of Recruits who snuck out for a few beers in Darwin. 12 men remain in the running for their dream prize – a contract with an AFL club. Week 4 and The Recruits spend the week in their home town of Melbourne, with the focus being on “pressure”. Coaches Michael Malthouse and Ben Dixon take the boys to the Richmond FC swimming pool and give them a taste of hypoxic swimming training – another way to improve their fitness. A surprise for the boys is a visit from Olympic hero Ian Thorpe. He gives the Recruits a few pointers on how to improve their swimming and chats to the boys about how he handled pressure across his long career. 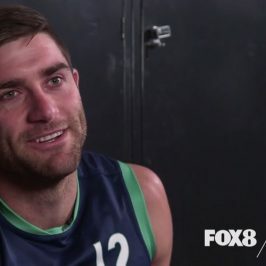 With this week being the first Gay Pride round in the AFL, he also chats about homophobia in sport, and how each of them should stand up and realise that it is not acceptable to tolerate any kind of homophobia in sport. Eleven men remain in the running for their dream prize – a contract with an AFL club. Week 5 kicks off with a beach recovery session at St Kilda, then a Captain’s Challenge with the Jetstar Little Athletics, who teach our Recruits that they must listen if they want to improve – even if that advice is coming from kids. Cathy Freeman chats to the Recruits about making it at an elite level and shares with the boys some thoughts from her time in the spotlight. 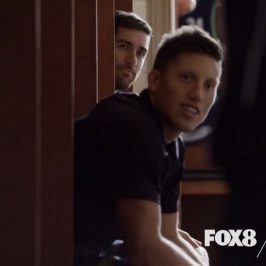 This week’s game takes the Recruits to Coach Mick’s old stomping ground – the Collingwood FC Training Centre, and the team face an opposition who know exactly what they are going through: it’s the last series Recruits, including the previous winner, Johann Wagner. Their coach is also someone familiar to the Recruit family – Michael Voss, who is impressed with a few of the current crop. At the half way point it’s a brutal delist, as the coaches move forward in finding who can have a career in the AFL. ‘Dedication’ is put to the test, as 8 remain in the running for their dream prize – a contract with an AFL club. After a tough training session at the home of the Western Bulldogs, the Recruits are shocked by an early morning wakeup from Barry Hall. 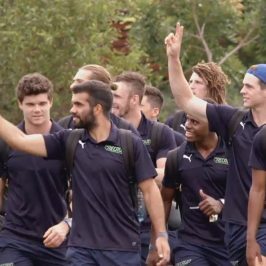 All fly to Newcastle to compete in the Captain’s ‘Raw Challenge’, and winner Jayden runs the Recruits out for a battle on the SCG against the Sydney Swans Academy. It’s a strategic delist but things don’t go to everyone’s plan and a favourite says goodbye. “Team Work”. 7 men remain in the running for their dream prize – an AFL contract. Paul Licuria pops in to the Recruit training session while the boys are pushed to their limits. It’s a pressure test at the racetrack as Matt races to become king of ‘The Pits’ and try for two-time Captaincy, and Daniel leaves the team unimpressed with his lack of effort around his food. There’s no game this week but the Recruits puzzle their way through a Fitbit Challenge and one of the favourites makes a shock delist decision. “Resilience”. 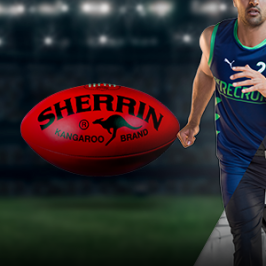 6 men remain in the running for their dream prize – an AFL contract. After a session with Coach Mick, the Recruits head to a boxing workout with Lauryn Eagle. The Captain is decided with a Helicopter Underwater Escape Training exercise – and Jackson’s determination sees him take the prize – which also includes a chopper ride to this week’s game in Marysville, with non-other than Cricketing legend Shane Warne, who coaches the Emergency Services opposition in one of the most physically demanding games the Recruits have played. Jackson gives the coaches a dilemma when he decides to use his Captains Call with an unexpected result. ‘Determination’. Five men remain in the running for their dream prize – an AFL contract. Mick and Dicko swing past the Recruit house for a Jackson-cooked brunch as this week focuses the Recruits on how close they are to the end. A Captain’s Challenge at the MCG finds a leader who has the strength to be the last man standing. The game this week is a once in a lifetime opportunity for the boys as the AFL Players Association fields a team featuring legends Jonathan Brown, Barry Hall, Brad Sewell and Brian Lake. Coached by Kevin Sheedy, they show the Recruits what it’s like to play with the big boys. It’s a stressful time for the Recruits as their journey is nearly over – and the final three Recruits to make it through to next week’s Final is decided. Click here to bid for your chance to win one of the Alumni’s signed jerseys from Ep 9 for Ladder and help youth break the cycle of homelessness. The Cut: Fifty footballers from across Australia converge in the hope of gaining an AFL contract. A competitive game takes its toll on several players, leaving the Executive Team with tough decisions on who will move forward. Drop Zone: The boys hit the field during an AFL game in a kicking challenge that sees some hit the mark, while others fall flat. Then, a helicopter drops them into the ocean in a team challenge that pushes some to their limits. Leap of Faith: A bungee jump challenge tests the boy’s courage, before taking on their toughest test yet – a footy game against prisoners. A shock twist after the game changes the competition. Child’s Play: A test in discipline has the boys flipping out. Then the boys feel the long arm of the law as they play a heated game against some of Melbourne’s finest with another brutal announcement after the horn. Survival of the Fittest: The boys are off to the Red Centre to get down and dirty against an All Star Indigenous team. As the dust settles on the outback adventure, a single mistake could cost one Recruit his AFL dream. Stranded at Sea: The boys tackle each other head on in this week’s Captains Challenge, as some rivalries get heated. Later, the team challenge leaves a few of the Recruits ship wrecked, and an emotional delisting ends in tears. Follow the Leader: The final eight get a lesson in leadership by one of Australia’s biggest sporting stars. Then, the new guys battle the old when the boys play an All Stars game against some of their AFL idols. Recruits at War: The boys are off to the Nation’s Capital to step up their fight in the most competitive challenges yet. Then, as tensions mount in the locker room, which Recruit’s dream will come to a disappointing end? Swimming with the Sharks: A trip to Adelaide gives the boys one last chance to impress in the biggest game of their lives. Then, during some down time the Recruits come face to face with their fears in a lesson on courage. The Draft: After weeks of competition, we are down to the final three. And for one, the dream to become an AFL player will become reality. Join us live, as a specially convened draft will decide who becomes the first ever recruit.